Are you ready to make a crazy-fun project with pompoms? How about some embellished flip-flops?! 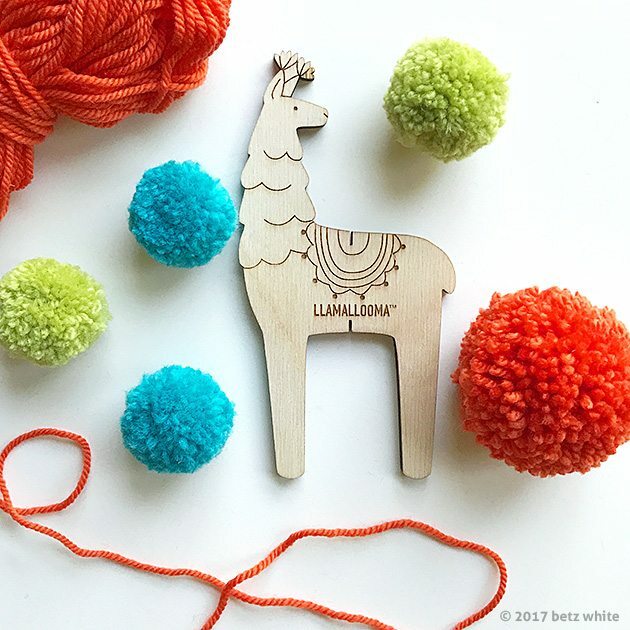 Grab a fresh pair of flip-flops off of the discount rack, some yarn, scissors, tapestry needle and a pom-pom maker, like the LLamallooma! 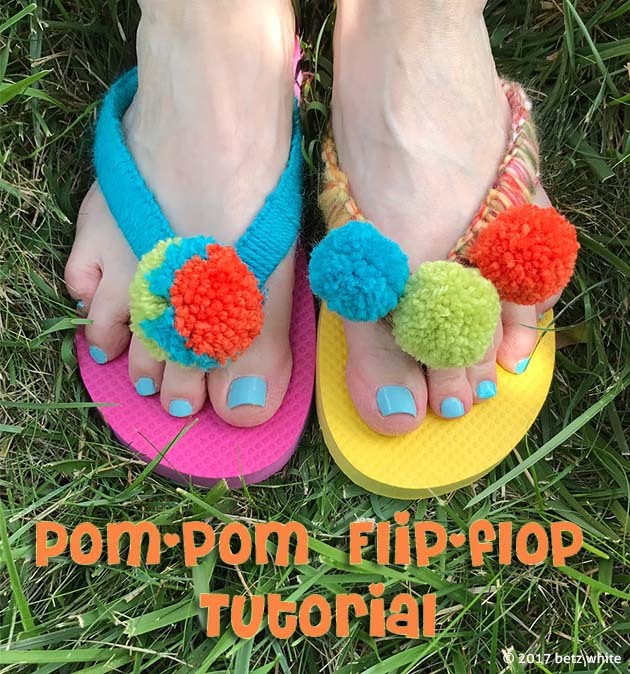 If you need pom-pom making how-to’s, you can check out my youtube video, The Basic Pom-pom Tutorial for a large pom (orange, above) or check out my last blog post for the Mini Pom-pom Tutorial. Both can be made using the Llamallooma! Pull your materials together then let’s get started! Follow the numbered steps below along with the coordinating numbered photos in the above collage. 1) Cut a piece of yarn, about 6 yards long. Find the center of the yarn then tie a single knot around one of the flip flop straps near the footbed. 2) Next make a knot around the strap, similar to a macrame half knot: Lay the right tail over the strap, then take the left tail and go over the right tail, under the strap then through the right loop. 3) Now do the same but start with the left tail: Left tail over the strap, then right tail over the left tail, under the strap then through the left loop. Basically you are making a square knot with the strap of the flip-flop running through the center. 4) Repeat knots 2 and 3, alternating sides. Push your knots close together to cover the strap. 5) Keep going, working your way past the toe bar then all the way to the other end at the footbed. Depending on the thickness of your yarn, you may come up short. If you run out of yarn, knot it on the underside then start with a second length and keep going. 6) If you haven’t already, make your pom-poms! (see links to tutorials near the top of this post). 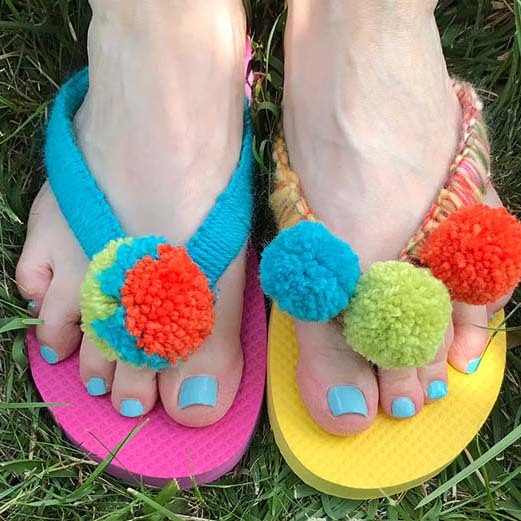 For this pair of flip flops I used 6 mini pom-poms, 3 for each foot. 7) (Skip this step if you already have tails on your pompom) Thread a 12″ piece of yarn onto a tapestry needle. Poke the end of the needle into the pom pom to find the center tie. Push the needle through the pompom, catching the center, and out the other side. 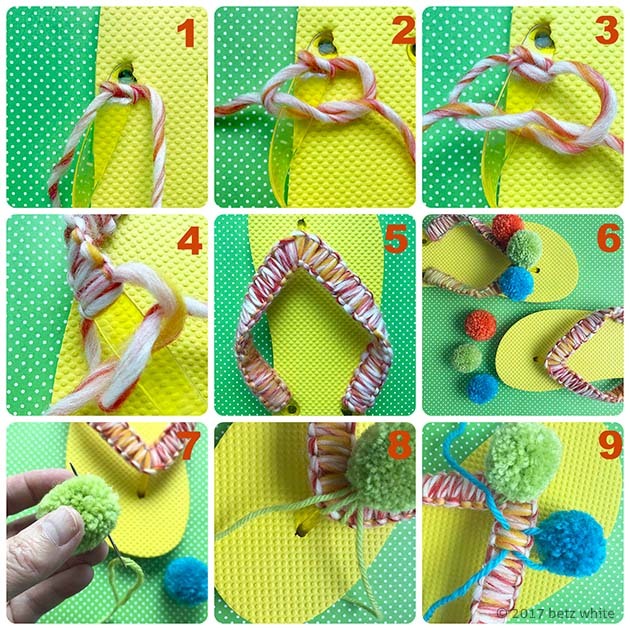 8) Place the pompom at the point of the flip-flop. Wrap the tails around the point on either side of the toe bar then back up under the pompom. Tie a double knot at the base of the pompom to secure. 9) To attach the other 2 pompoms, repeat Step 7 then use the tapestry needle to take a stitch with the tails under the yarn wraps as shown. Pull the pom close the the strap then double knot the tails under the pompom. Done! Now repeat this for the other foot to complete your pair. I made another version with just one larger pompom in the center, above left. I made it multi colored by wrapping 3 colors of yarn around the Llamallooma, one at a time. The straps are wrapped with a skinnier yarn with a slightly different knotting method but it took much longer to wrap. I recommend using thick yarn! These are soooo comfy! And even though I used wool yarn they are not hot or itchy at all. I love them! I hope you try this out and if you do please let me know! Pom-pom away!